In pop culture, few things are as synonymous to Chinese martial arts as the wooden dummy/mu ren zhuang. 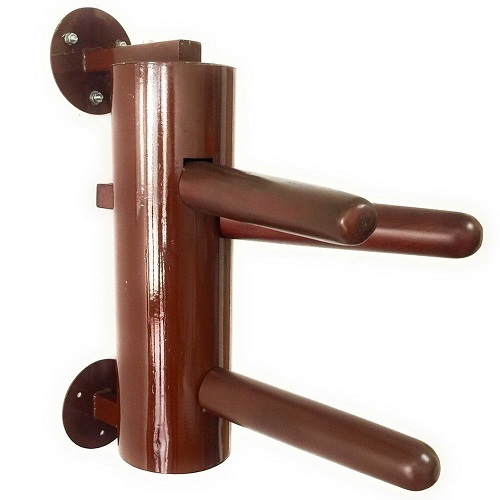 Also sometimes called a wing chun dummy, it is a training tool used by many traditional martial arts in Southern China, where more emphasis is placed on the hands than the feet. Bruce Lee was a big believer in using the dummy to train. Thus, the dummy is an integral part of Jeet Kune Do. So why did Bruce Lee and so many other Chinese martial artists have an affinity for it? There are 2 specific reasons for it. 1. It hardens the hands/forearms. 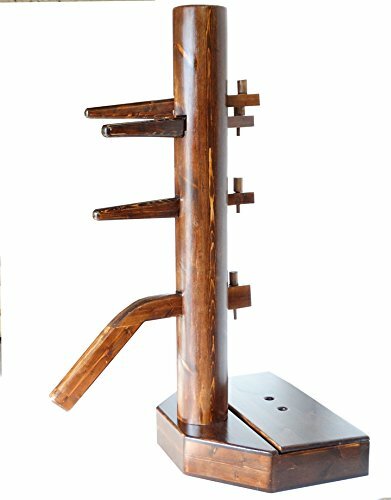 Much in the same way that muay thai practitioners kick trees and hard bags to condition their shins, the wooden dummy works in the same way to condition the forearms. Because you are causing micro-fractures to the bones of forearms, your body heals these micro-fractures through a process called ossification in which your bones become more dense through the process of rebuilding and repairing. 2. It trains dexterity. Many people train with the dummy today to improve their hand-eye coordination and dexterity. Many of the drills that are practiced on the dummy include using your hands to strike specific parts of the dummy while side-stepping the dummy (or getting an angle) at the same time. This allows the practitioner to train their balance, footwork, and precision all at the same time. If you are looking for one to include in your practice, read our list below. After each entry, we've created a brief, easily scannable compilation of the product's respective pros and cons, as well as aggregate user rating. You will see that AugustaPro makes it on the list 3 times. That is because they have a large market share in this market and have put out quality products. Our first entry, the AugustaPro IRON Body will be a fantastic option for any martial artists looking for a heavy-duty option. This is a seriously sturdy piece of equipment that's designed for long-term performance. If you find yourself practicing your technique vigorously every morning, day, and night, the IRON BODY will suffice, to say the very least. A dummy that features an intuitive design and stellar build quality, you will be impressed with just about every aspect of this stellar training companion piece. As if it weren't great already, this dummy also utilizes extremely high-quality materials in its overall construction. Hardwood, quality plastics, and authentic metals can be found all over this dummy's exterior, and it handles like a dream. It comes highly recommended. If you are looking for something on the cheaper end, Augusta Pro also makes a half-size wooden dummy that you can mount to the wall. This one only has the top portion of the dummy so it does not include weights. This is a much lighter version than the full-sized Iron Body. At 1/3 of the price of the Iron Body, it is also an option for more cost-conscious customers. The body is made out of steel and the arms are made out of wood. The arm reaches out a little over 21 inches, are also adjustable in terms of positioning. Another wooden dummy by AugustaPro. So what's the difference? Well this one is made out of all wood, both the arms and the body, whereas the above two have wooden arms but a steel body. This is the most expensive option, solely because hardwood is expensive. So this is a good option for those that have the cash to spare and want a more traditional look (as the originals were made of all wood. This purchase will come with striking pads, to protect your hands, and also to protect the vanity of the dummy, since it is made of solid wood. 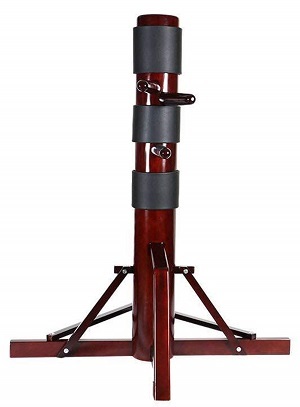 Unlike the AugustaPro Iron Body, this model has a tripod base so there is no need to secure it to the floor by other means. Although some people complain about the quality of the wood, it does come with a 5 year warranty for wear and tear, essentially leaving you worry-free about damage. Next up is the Attachmate Dummy Trainer, which is an excellent option for beginners, or those looking for an option that doesn't require as large a commitment as some other entries. This option is by far the most portable on our list, a fact that will make great for nomads and travelers. This dummy is so lightweight, in fact, that it can be easily taken with you virtually anywhere. The fastening material uses light materials like velcro and plastic to attach the bulk of the hardware to cylindrical posts. While this means the option does sacrifice some durability and stability, it may just be the best option available for those looking to be on the move a lot while honing their craft. In addition to excellent portability, this option also includes flexible striking poles. This means that beginners won't need to worry about being especially precise. In addition, the potential for injury is significantly reduced when using this option. These factors combine to make it our recommended dummy for those just starting out, as well as for younger practitioners. This wooden dummy weights approximately 77 pounds, or 25 kilograms. This option for Dummymaker will be a great fit for more experienced practitioners. Sturdy and full of fantastic build materials, you will be able to strike as hard as you can with this fantastic dummy. Additionally, this selection features some great traditional aesthetics, which can make it a great fit for themed-gyms and more specialized training facilities. As far as extra features go, this option is a bit lacking. It doesn't include any extra tools or accessories, like gloves and straps, but in our opinion, it will more than make up for it with its excellent performance. If you're wanting for an option that can stick with you for a long time, look no further: Dummymaker has you covered. We highly recommend it. Our final option is yet another stellar selection from Dummymaker. This dummy is sure to impress, as its one of the most unique on this list. 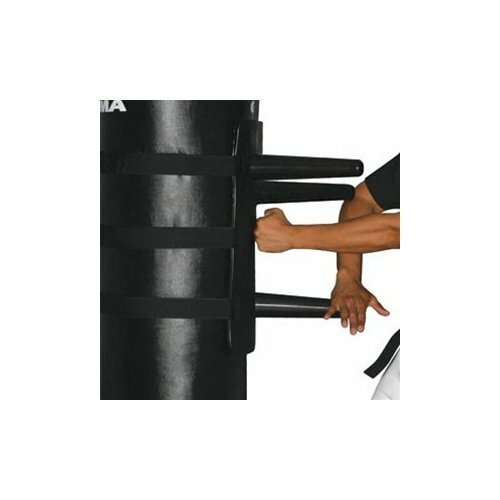 Designed to function with a variety of martial arts, this selection can be used with multiple people at once and is height adjustable! This is an incredibly unique option and one that can add greatly to its already stellar value proposition. 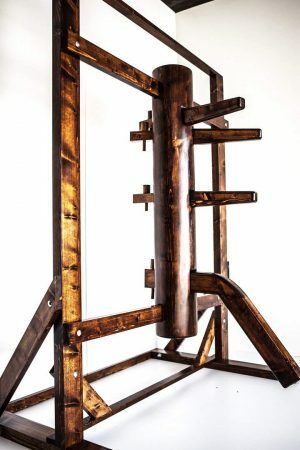 If you're running a martial arts school and are looking for a way to cut down on costs, consider this fantastic option. While you do sacrifice flexibility, the dummy more than makes up for it with its fantastic durability. Even better, this option doesn't need to be installed, as it includes its own housing chassis. And there you have it: Our picks for the 6 best wooden dummies on the market. There aren't a lot of choices out there when it comes to this equipment but these are the best choices we could find. While you don't need a dummy to practice martial arts, it has been shown to greatly increase your performance by including one, especially one requiring hand dexterity. If you're looking for more MMA equipment reviews, go to our reviews section.